> Workday > Why Workday? Every day, hundreds of organizations communicate, collaborate, and drive their business forward with Workday cloud applications. Our customers say they gain unprecedented visibility into their workforce, improve overall productivity, and get the right people working on the most important initiatives—things they could not achieve with legacy systems. And all of this is accomplished with applications that are intuitive and easy to use. Our customers are unique and have different goals, challenges, and priorities. What they share in common is that they all decided to move beyond legacy systems to the cloud with Workday. 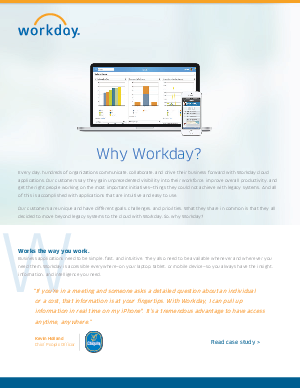 So, why Workday?